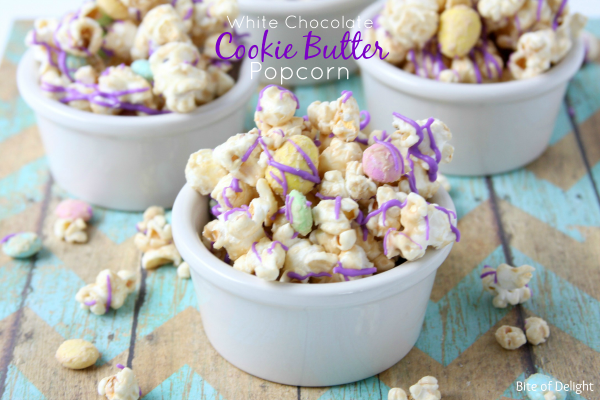 White chocolate and cookie butter are the perfect pair for popcorn! Throw in some chocolate candies, (especially if you have leftover Cadbury mini eggs from Easter, like I did!) and you’ve got a treat that will disappear in minutes. This is so easy to throw together, and my kids LOVED it! We sent some over to a neighbor and when we were texting later she said, “That popcorn you brought was ridiculous!!! Yummmm. You can bring more of that any time!” And that is why she is my favorite neighbor. I’ve been putting cookie butter on and in everything lately. I can’t stop! It’s a great compliment to a lot of sweet flavors. So it seemed only natural to put it in our favorite white chocolate popcorn (that my sister-in-law told me how to make nearly ten years ago!). You can use microwave popcorn as well, but I don’t buy it anymore, so this is written for popping your own kernels. Pop popcorn kernels and remove any unpopped kernels. Place in a large mixing bowl and add the candies. Melt the almond bark according to package directions. Add cookie butter to melted bark and stir to combine. Drizzle bark mixture over popcorn & chocolate and toss to coat. Pour out onto parchment or wax paper to harden. If drizzling with colored bark or melts, melt according to package directions. 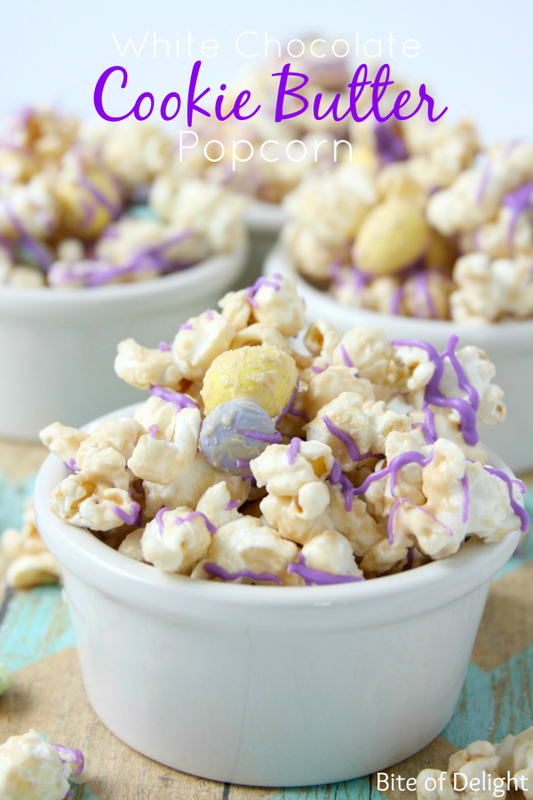 Spoon into a plastic sandwich bag, snip the corner, and drizzle over the popcorn. As soon as the bark is dry, place in a serving bowl and enjoy! I have tried the Trader Joe’s brand and the Biscoff brand of cookie butter. I have to say, I prefer the flavor of Trader Joe’s. There are VERY similar, but there’s just something about the Trader Joe’s that tastes better to me. I did side-by-side comparisons, and I just didn’t like the Biscoff quite as much. Still yummy, but I always buy TJ’s now. This is in no way sponsored, just an honest opinion! THE WINNER OF LAST WEEK’S MOTHER’S DAY GIVEAWAY IS LATONYA T! Check your email, we’ve sent you the details about getting your gardening grab bag! Please reply within 24 hours. Thanks to everyone who entered! !